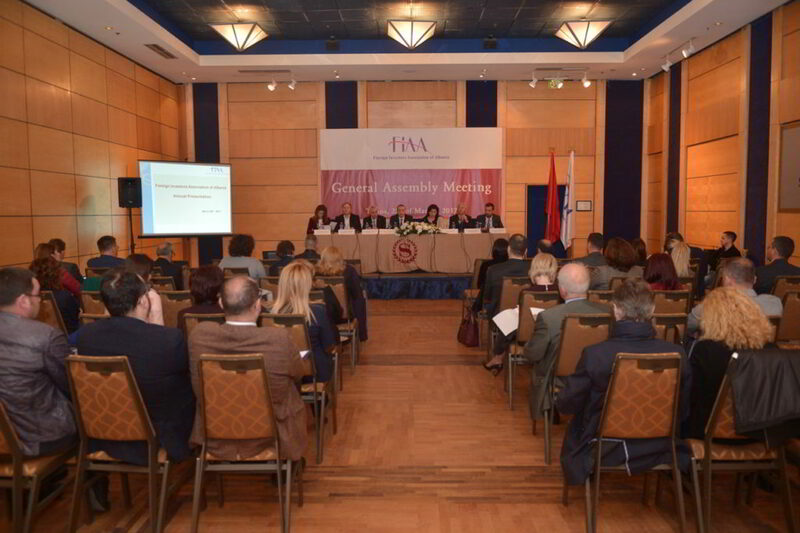 In March 28th, FIAA hold the General Assembly Meeting of the Members and conducted election process for four new Board Members including the Appointment of the Chairman of FIAA for the next two years. In his opening speech the President of FIAA, Mr. Silvio Pedrazzi highlighted some of the main achievements and challenges he had during his Chairmanship and emphasized the importance of the Organization as the best Instrument for the Foreign Investors in Albania. Mr. Pedrazzi did also thank the members for the support and trust given to his mandate and expressed his will to further continue his mission on representing FIAA as Chairman even for the next two years. During the meeting, the Executive Director of FIAA, Mrs. Jazoj made the Annual Reporting on FIAA’s work and actions. In particular, she highlighted the role that the Business Environment Survey has on identification of the main business concerns and their proper follow up with the Law and Decision Makers. On the other side, The Deputy Chairman of FIAA, Mr. Dietlof Mare stressed out the importance of a consistent follow up on the defined business concerns and intensification of communication with the Authorities. He also encouraged the Members for a better involvement and interaction in all FIAA initiatives and a higher involvement in the created sectorial Committees. The Meeting continued further with a Reporting slide from the Chairs of FIAA Committees like: Energy Committee, Mining and Oil and Gas Committee, Integration Committee and the most recently created, the Tax and Financial Committee. All Committees’ Representatives made a short reporting on the work done during the last year and shared with the Members the upcoming objectives. Meanwhile, Ms. JAZOJ presented the Members with a New Approach that FIAA should apply in its philosophy which was chosen by the various recommendations of the members themselves. The Assembly of members continued with the voting process assuring the necessary quorum of members, and followed with the Candidates self presentation. The Chairman of FIAA for the Next two Years was elected Mr. Silvio Pedrazzi who got the highest number of votes. FIAA is a serious business organization that has built its integrity over 17 years. This organization is an independent institution that is not influenced by politics, but it is a reliable source of information and a very active lobbying instrument, offering unparalleled networking opportunities, and a good advocate to its members and to the business climate at large. The evening concluded with cocktail celebration among FIAA members and guests.